Had a weird accident on the weekend, rear wheel slipped out on a dry corner for no apparent reason. Hit the deck with my arm and hip pretty hard, got some good road rash. Got home and gave it a good rinse with soap in the shower (ouch) and made sure there was no debris stuck in the wound. Taped some gauze over it and put up my feet. Since I've been taking it easy, I had some time to research if there were any new products that might be better. First impression: Feels like there's nothing there, and it's way more flexible. The range of movement with my arm is much better than gauze and tape. Application was easy, but I recommend reading the instructions or having a look at Youtube as there is definitely a technique. The adhesive seems to be very conforming around the edge and over the wound. Overnight the Tegaderm patch seems to have "melted" the existing scabs, there was a small amount of fluid buildup so I picked one of the edges a little to drain it. It's quite interesting (and more than a little gross) to have a transparent window directly into the wound to watch its healing progress. 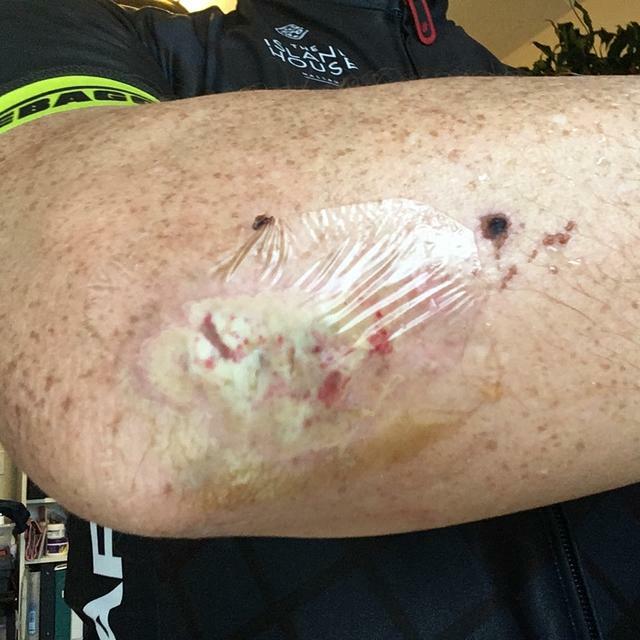 Went for a 1 hour moderate intensity ride, neither the dressing on my hip under my bib shorts nor the dressing on my elbow exposed to the air showed any signs of peeling. I tried a variety of positions (hoods, tops, drops, standing) and the dressings flexibility presented no restriction of movement at all. There was some minor fluid buildup which I drained again before showering, but no leakage during the ride, even at the edge I had previously re-sealed. Showering was no problem at all, the water did not seem to affect the dressings in any way. Neither dressing appears to need replacement so far. Great product!!! Definitely keeping a couple of these Tegaderm dressings in my "go bag"
The wound seems to have finished draining, the white looks like new skin forming. The dressing has prevented a scab from forming (and dissolved the old scab as previously noted) as claimed. Went for a hard ride (lots of sweating) and there was a small amount of leaking at the spot where I've been picking the edge to drain the dressing. Showering as normal with full elbow flex and dressings still show no sign of peeling. Wound appears to be remaining sterile. I've seen conflicting specifications for the Tegaderm dressing that it can be left in place for max 4 days or 7 days, I'm going to leave it on for at least a few more days to see what happens. 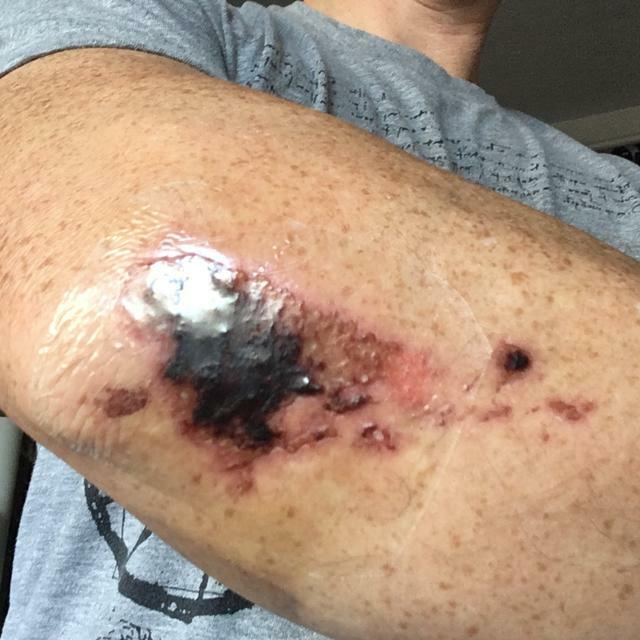 You can see there were a few spots of road rash that the dressing didn't cover, so the time to heal can easily be compared to those spots. 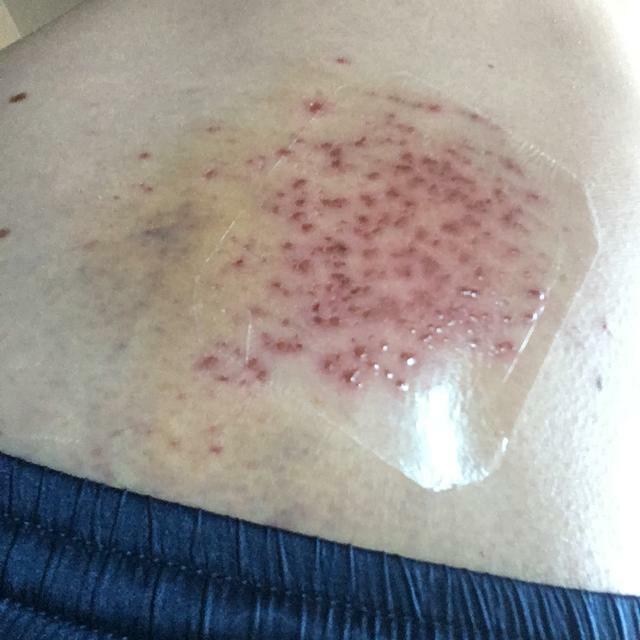 Going into week 3 now and the road rash is still healing. 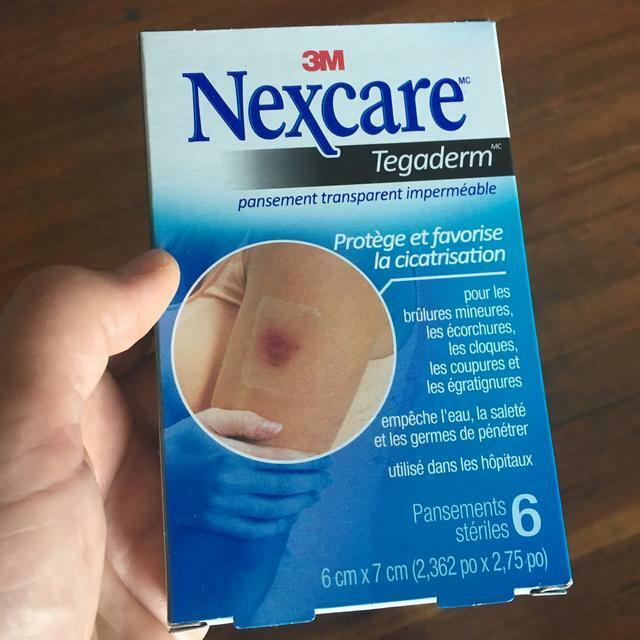 I've changed the Tegaderm twice now, keeping the wound covered to prevent abrasion against clothes etc and a covered wound apparently heals faster with less scarring. The second time I used too much antibacterial ointment before applying the Tegaderm so it didn't stick very well along the edges. Placing a basic wound dressing around a wound can help prevent clothing from rubbing against and irritating the affected area. Even as children, people generally know that they’re supposed to leave wounds alone during the wound healing process. Itching can further irritate sensitive skin, remove growing tissue, slow the recovery process and worsen scarring. However, healing wounds can sometimes become very itchy, tempting some to scratch the affected area. Read on to learn why itching occurs, how scratching can be harmful and ways to soothe the irritation. Why does my wound itch? The skin contains specialized nerve fibers that detect when the dermis is being irritated and send signals to the spinal cord, communicating that there is an itch. These nerves can be activated in several ways. For example, if a bug crawls on you, these fibers focus your attention on that area to warn you about a potential danger. According to the University of Cambridge, this is called a mechanical stress. Wound healing also elicits mechanical stress that activates itching. As it heals, the cells around the wound proliferate, which means the margins around the wound grow and migrate inwards toward the base. In fact, the cells follow an electrical pathway at a voltage that is different than the margin so they can tell where the base is. The cells then unite at the center, attach together and contract to pull the wound shut. This process creates a mechanical stress that activates the itch nerves and tells the spinal cord to scratch. These nerve fibers can also be activated by chemicals secreted by the body, which is how wound healing causes itching. As the University of Cambridge explains, the body releases histamine in response to the wound and its sudden exposure to outside elements as a protective function. Other factors can also add to the itching. As the AARP reports, during the recovery process, scar tissue begins to form over the affected area. When too much of this tissue grows, it can form hard, smooth growths known as keloids, and these can irritate the skin, particularly when rubbed against clothing. Though they’re generally not bad for one’s health, they may lead to discolored skin after healing and can enhance scarring. Scratching a wound that is trying to heal can cause damage to the new tissue that has grown to replace and repair the damaged tissue. If this happens, it can slow the healing process, which leaves your body susceptible to wound infection longer and can result in excessive scarring. Additionally, it can cause potentially harmful bacteria on the hands to transfer to the wound, again putting you at a higher risk of developing infection. * Wash gently with soap and water to remove any dead cells that may be causing irritation. * Protect the affected area with a basic wound dressing to stop clothes from rubbing against it and to keep potentially harmful bacteria out. * Use a cool compress for a short period of time to numb itching. * Anti-itch creams may be used if the itching persists and becomes too much to handle.